For many kids growing up in the 1960s, slot cars were a regular part of Saturday afternoons. Even those who grew up after the little cars’ heyday have fond memories of the whirring sound echoing off the walls of a friend’s basement. Here’s a look back at these miniature racers that have entertained generations of drivers, both young and old. The first slot cars were introduced in 1912 by the Lionel Train Company as an accessory for model train sets. The toy worked on a similar concept as Lionel’s trains, running on a pair of raised platforms with an electrified train track in a small trench down the middle. The two, 1:24 scale cars, each about 8” long, had conductors on the bottom that fit into the slot, powering the small motor, and helping guide the cars around the track. While the toys sold well, World War I cut Lionel’s European sales in half, so the company halted production to focus their efforts on better-selling train sets. Over the next few decades, various companies and amateur model builders throughout the U.S. and Europe built toy cars that ran on diesel, rubber bands, and even wind-up, clockwork mechanisms. But electric cars were a rarity until the 1950s, when British racers brought them back thanks to their clean, quiet, and sustainable mode of propulsion. As before, slot cars were reintroduced as a toy train accessory, which meant they conformed to the most popular train size, OO scale (1:76), making the new cars about 2” long. Like the 1912 Lionels, the cars ran in slots, and even had adjustable speeds thanks to a hand-held, push-button controller. In the late 1950s, the Kustom Kar Kulture was just getting its start in America. Everyone was modifying their old jalopies with new paint jobs, souped up engines, and aftermarket add-ons. Likewise, British slot cars could be modified with tires that gripped the track better, high-performance motors, magnets to help the car stay on the track, and replacement conductors for better control. If you were really ambitious, you could even build a car from scratch, doing all your own soldering and wiring. The two cultures seemed like a natural fit, but the Atlantic Ocean was keeping them apart. Between 1961 and 1966 – the golden age of slot cars – there were around 3,000 commercial slot tracks built in hobby shops and corner stores across the U.S., with an additional 200 in Europe. Kids could go to their local raceway and pay about $2.00 for an hour of racing on tracks that often filled the room with twists, turns, and as many as eight racing lanes. One company, American Model Car Raceways, even made a business traveling the country to build tracks. Their biggest, nicknamed “The Purple Mile,” was 220’ long. But even The Purple Mile was dwarfed by “The Monster,” a 475’ long, 6-lane track at the East Meadow Miniature Racing Association (EMMRA) in Long Island, New York, considered the longest track in America at the time (pictured above, courtesy of EMMRA Slot Racing). As with any fad, the downturn was on the horizon. By 1968, only about 250 commercial tracks were left in America; a year later there were fewer than 50. Many people blame the hobby itself for this drop-off, by not properly regulating competitions. Without racing classes, it became nearly impossible for a new driver with an off-the-shelf car to compete against a long-time driver with a custom-built racer. Discouragement set in and the hobby lost fans in droves. Regulatory leagues were created to help, but it was too little, too late. Still, the hobby was booming business during its peak years, bringing in over $500 million in annuals sales from 1963 – 1966. In today’s money, it would be a $3.3 billion per year industry. Other than bragging rights at your local track, being a great slot car driver wouldn’t appear to be a very marketable skill. But in 1965, Russkit, a popular brand of car, built the first professional slot car racing crew, including Mike Morrissey, Rick Durkee, Ron Quintana, and Len Vucci, who were dubbed “Team Russkit.” The team traveled the country – in matching blazers no less – hitting 50 tracks in three weeks to show local racers what the Russkit cars could do. Other companies followed suit and soon kids too young to drive real cars were on the corporate payroll. After their slot car days were over, the Gold Dust Twins’ careers followed fairly predictable paths. Gross went on to design award-winning speakers for Polk Audio, while Ursaner is a dealer and collector of – you guessed it – classic Corvettes. 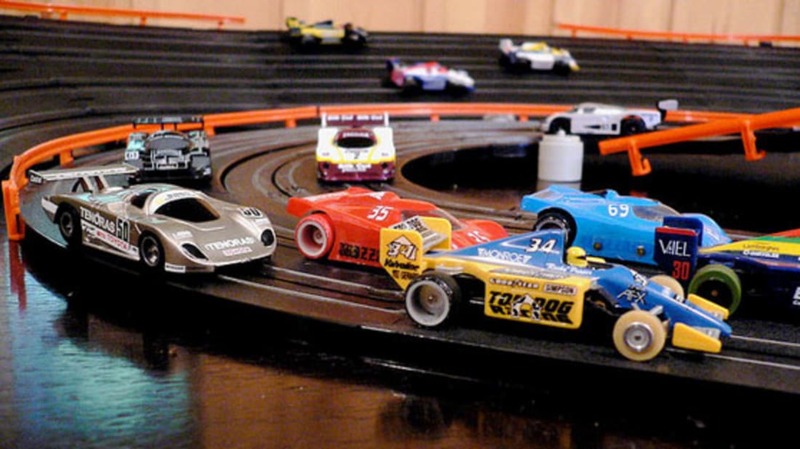 Of course slot car racing continues today with a niche – but dedicated – community of drivers. The most popular sets sold today are considered HO scale (1:87), with cars measuring between 2” and 3”. With very few commercial tracks left in the United States, the hobby primarily lives on in fans’ basements. But with track pieces sold separately, there are some pretty impressive homemade tracks that rival the ones built during the commercial track era. If you’re thinking about getting back into slot cars, the good news is not much has changed in the last 40 years. The only big shift in technology has been the introduction of digital controls. With older, analog sets, each car had to be in its own racing lane so it could be operated by a single controller directly plugged into that lane’s electrical supply. Digital slots, though, have a computer chip on-board each car that can be synced to a single controller, allowing more than one car per lane. This introduces a whole new aspect to slot car racing – strategy. Players can press a button on the digital controller to have their car pass others at special cross-over sections of the track. Cars can also be supplied with a finite amount of “gas,” meaning drivers have to take into account pit stops during the race. In addition, you can get a lot of race information with digital controls, like lap time and scale speed ratings. Of course if you just want to set up the track, grip the controller and go, analog sets are still quite popular and even preferred by some drivers. In an effort to bring in new fans over the years, many slot car companies have produced sets that are based on a popular television show or movie. Most have a signature vehicle that would lend itself well to slot cars, like the Dukes of Hazzard, Batman, Back to the Future, Speed Racer, Transformers, Knight Rider, The A-Team, and Teenage Mutant Ninja Turtles. Some properties, though, like the X-Men, Spider-Man, Sonic the Hedgehog, and The Simpsons are a bit of a stretch. Although strange, The Simpsons‘ one is at least creative – it features Bart and Homer on skateboards. The Brooklands was the world’s first venue specifically built for motorsports. Opening in 1907 in Surrey, England, it was a 2.75-mile concrete track that was home to many automotive firsts. It closed in 1939 when the airstrip on its infield was needed for operations in World War II. After damage from enemy bombing and roads built for military purposes that cut through the track, it was never used for racing again. That is until 2009 when James May, co-host of the popular British TV show Top Gear, presented a series of specials for the BBC called Toy Stories. The premise behind the show was to use old toys on a full-scale level, like when they built an actual Lego house. One episode featured May using Scalextric, Britain’s most popular brand of slot cars, to recreate the entire Brooklands track. The monumental task required 400 volunteers and 20,000 pieces of track to complete the circuit. But that was only half the challenge – many areas that were once covered by the racetrack have since been rebuilt as houses, businesses, a street, and even a small pond (they used an inflatable platform to get across). By the time they were finished, it was the largest slot car track in the world, beating out a 2007 entry that was an impressive 1.59 miles long. Did you have a slot car track when you were a kid? Are you a racer today?